14K Rose Gold Engravable Double Bar Heart Necklace with a 16'' Chain by JEWLR by TSD at Blood of The Young. MPN: JN346_14KR_16. Hurry! Limited time offer. Offer valid only while supplies last. 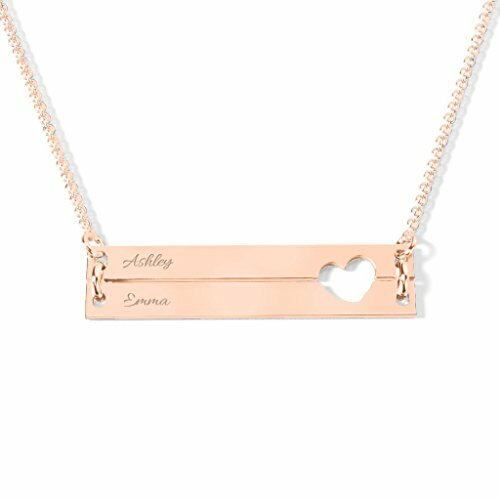 See the names or text that are meaningful to you, engraved into solid (never plated) 14K Gold. Quality crafted in North America in just a few days. 99 Day Return & 1 Year Warranty included. Free Gift as our way of saying thank you! Click Customize Now to begin personalizing your pendant. Choose from four different fonts, to engrave TWO names or words. If you have any questions about this product by TSD, contact us by completing and submitting the form below. If you are looking for a specif part number, please include it with your message.